The Rakkiddo Shoe Wheel is possibly the coolest way to store shoes that I’ve seen. Sure, those transparent plastic boxes are practical but the Wheel is fun. It holds up to twenty pairs of shoes and I dare you to resist colour coding them like they have done in the picture above. 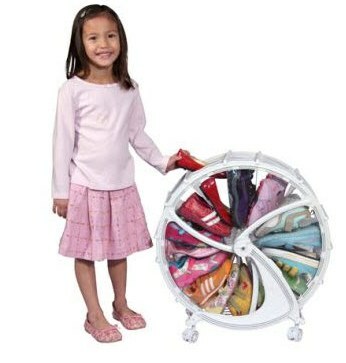 Here’s a novel idea – with the Wheel in the house, kids might actually want to put away their own shoes! The Rakkiddo Shoe Wheel is available in pink, blue or white and costs £57.95. It is available from Tszuji that ships internationally by arrangement. Shoe fanatics will be pleased to note that larger Wheels are also available for adult shoes and that Tszuji (the ‘shoe storage specialists’) are opening an Australian online store in 2011.